At Ferrari-Carano, we celebrate our Italian heritage through our love of food and entertaining, so a sunny, food-friendly Italian-style rosé is a thrilling addition to our wine family. 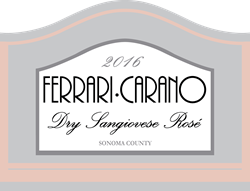 Ferrari-Carano Vineyards and Winery has announced the debut of the brand’s long-anticipated rosé: 2016 Dry Sangiovese Rosé. Hitting shelves in early February, the wine’s pretty pink color and flexibility with food make it an ideal wine for Valentine’s Day sipping. At just $14 SRP, the winery anticipates it will be a top seller now through the warm spring and summer months, and beyond. “At Ferrari-Carano, we celebrate our Italian heritage through our love of food and entertaining, so a sunny, food-friendly Italian-style rosé is a thrilling addition to our wine family,” says Owner Rhonda Carano. For more information about Ferrari-Carano Vineyards and Winery, please visit http://www.Ferrari-Carano.com. For press inquiries, high resolution images, or interview requests, contact Chelsea Kurnick at 213-985-1011 ext 5 or chelsea(at)mccuecommunications(dot)com. Founded initially as a small wine farm in 1981 by hospitality-industry pioneers Don and Rhonda Carano, the Ferrari-Carano family of brands now comprises the very best in hospitality, wine and food experiences in California’s North Bay region. The portfolio comprises destination wineries in Sonoma (Ferrari-Carano Vineyards and Winery) and Mendocino (Lazy Creek Vineyards) counties; three wine production facilities; 26 estate-owned vineyards spanning more than 1,900 acres across three counties; the 44-room Vintners Inn and John Ash & Co. Restaurant; and Seasons of the Vineyard Tasting Bar & Boutique in Healdsburg. Ferrari-Carano is one of the region’s leaders, setting the bar for the highest standard in hospitality, wine quality and sustainability.